What if you would not need to carry the Book-of-Changes and three Chinese coins with you, but that you just could ask any question any time, at work, with friends or relatives, in an internet café or a hotel, as long as there is a computer, tablet or cell-phone with internet connection nearby? Of course we found several sites that promised this feature, but it never came anywhere near what we were looking for. You can see for yourself; in DMOZ, the open directory project, many Online I Ching sites are gathered together (including this site I Ching Online). If we found a site where we could ask a question online, and if we managed at all to understand the often difficult instructions how to get on with the procedure, we saw all kinds of things wrong. When we analyzed the Flash code, it appeared that any Hexagram would always consist of an equal amount of heads and tails. For the six throws of three coins, there were nine heads and nine tails, mixed together randomly; an entirely wrong algorithm, and limiting the number of possible readings to just a handful. Yet, there do exist some very elegant programs you can run on your computer, but you do not always have your own laptop with you. Actually, we had such a program ourselves, the "I Ching Empower Tool" by Roger Norton and David Miller, a beautiful and very user-friendly desktop program. Until July 6th 2009, this program was available at http://ourworld.compuserve.com/homepages/empowertools/, but on that date the Compuserve OurWorld was shut down permanently. The site was not supported since 1995 and many links did not work anymore. When we used the freeware version of the program we found a little problem with the algorithm for throwing the coins, because we got far too few changing lines. We never tried the registered edition. We gratefully used the texts in this program as an initial base for I Ching Online, because they are the best short interpretations of the ancient texts of the Book-of-Changes that we know. Later we added the original texts. The classic translation from Chinese was in German, by Richard Wilhelm in 1923. Richard Wilhelm, born in 1873 in Germany, more than any other, is responsible for opening up to the West the vast spiritual heritage of China, and thus all of Asia. He translated the great philosophical works from Chinese into German, where they have in turn been translated into the other major languages of the world, including English. To this day, among the dozens of translations of the I Ching now available, his 1923 translation "I Ging - Das Buch der Wandlungen" ("I Ching - The Book of Changes") stands head and shoulders above the rest. An illness he caught in China as early as 1910, led eventually to his premature death in 1930. Since Version 2.0 (see below) for every hexagram and changing line you can click through to the corresponding original Richard Wilhelm translation, rendered into English by Cary F. Baynes in 1949. Nevertheless, the only way to read these original texts is by throwing the coins and then you can read the text for the particular hexagram or changing line as an excerpt from the Richard Wilhelm translation. If you want to leaf through these pages, you need a hard copy of The I Ching Or Book of Changes . 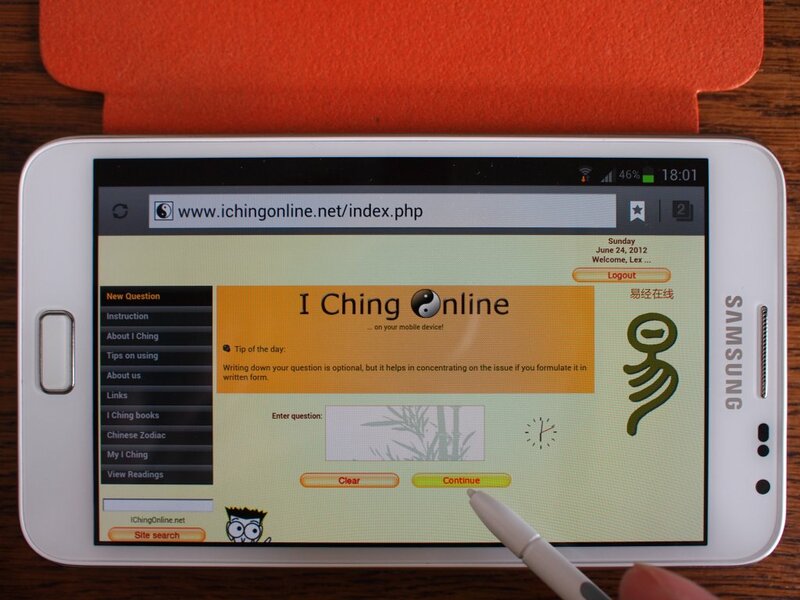 The mobile version (3.6) of I Ching Online was especially designed for smartphones with Android 4.0+ and a stylus (touch pen), which have mouse-over functionality by moving the pen just over the touchscreen. When we decided to develop our online webprogram, we had in mind to	make it as user-friendly as possible. The different aspects of the answer; Present, Changing Lines, Future and the separate Trigrams that make up the Cast Hexagram, can be read in tabs. Special attention was given to the Changing Lines, because if there are two or more, one of them prevails, and the program decides which one, according to a set of rules, explained on the Instruction page. From version 3.9 (October 14th 2012), on the (Hexagram Lines tab of the) Reading page, you can click on any Changing Line, to read about it. Until then you could only read about the one Changing Line that prevailed. And from version 3.29 (March 1st 2018), you can not only click on any Changing Line to read about it, but on any NON-changing Line as well. When you click a Changing or NON-changing Line, the "primary text" of that line appears, and by pressing the Read original text button, you can read the Richard Wilhelm translation for that Line. Clicking this Hexagram Lines tab again will reset the page. If you have any suggestions, please contact us at . Read our privacy and cookies policy, for details. Advertise on I Ching Online? If you consider advertising your product or service on I Ching Online, ask for the possibilities at . We will send you a list with available sizes, tariffs, conditions and some statistics. The I Ching Online mobile site has a different look in version 3.30 (February 26th 2019). The startpage opens without the menu-sidebar, and shows only one column, instead of three. Here, and on all other pages with the main menu, this menu can be displayed or hidden ("toggled") by clicking a ≡ ("hamburger"-) icon. On the cast-page where the coins are cast and the read-page with your reading, the left column is not displayed to make the rest more readable on a small device. From version 3.29 (March 11th 2018), on the (Hexagram Lines tab of the) Reading page, you can not only click on any Changing Line to read about it, but on any NON-changing Line as well. In version 3.28 (January 1st 2018), we have made some changes to make I Ching Online the site for advanced users as well as for beginners on the subject. For this we added some instruction to the page where the coins are cast and to the reading-page with the answer to your question. From version 3.27 (September 1st 2017), as you might have noticed, I Ching Online.NET uses a secure https-connection. And from version 4.0.44 (October 6th 2017), this site ICHING.ONLINE is secure as well! To celebrate I Ching Online's 10th anniversary (July 1st 2017), a very sophisticated feature has been added in version 3.26.1. Again for loyal members who joined years ago and who have since built a large history of readings, in the search function on the View Readings page you can search hexagrams for every particular individual line; whether it was changing or not. Together with the other search options you can of course easily construct an impossible combination, like a search for hexagram X transforming into hexagram Y without any changing lines, in which case you will get an empty result set. And most combinations would not make any sense either, like: "Give me all hexagrams where line 2 and 3 were changing, but not line 4 and 6." But you might very well be interested in a query like: "On what questions before did I get hexagram 14 with line 5 changing, regardless of the other lines?" In version 3.26 (Juny 7th 2017), the search function on the View Readings page has again been improved (compared to version 3.7). You can now restrict your search to a particular year, especially for members who joined several years ago and who have saved a lot of questions. Also improved is the search for Readings which had a particular Cast- or Transformed hexagram for an answer, which is now more intuitive. You can still combine this with the existing search for questions containing a specific text. Of course, the stricter your search, fewer readings will be selected in your view. Again you have one more reason to renew your subscription after (or better, during) your trial period! With version 3.25 (October 26th 2016), I Ching Online is compliant with the EU Cookie Law. Just to be sure, we show the cookie bar not only to visitors from the EU, but to every visitor, not making use any more of a database with IP-addresses to determine the country where the visitor comes from. Version 4.0 (April 19th 2016), has the same functionality as version 3 but will as yet remain without save-reading option. For the time being, when the save-reading button is clicked you will be redirected to www.ichingonline.NET (version 3), where your reading is saved in your account if you have one, or if you register as a member your reading will be saved in the new account you just opened. The new domain www.iching.online is hosted "in the cloud", and should run "blazing fast" (at least compared to version 3). It is planned for the future to move all accounts with their saved readings from version 3 to version 4. Version 4.0 Bèta (February 29th 2016), has been thoroughly tested until it did not need the "Bèta" qualification any more. The pages for throwing the coins, reading the answer and the original Richard Wilhelm-texts used to open in a fixed-size so-called "popup-window". Because the new Microsoft Windows 10 browser Edge does not cope with them correctly, these pop-ups have been gradually replaced with "normal" new windows that for most browsers usually open in a new browser tab. In version 3.24 (November 21st 2015), this migration has been completed. With version 3.23 (September 3rd 2015), I Ching Online has made a start with being compliant with the EU Cookie Law. At the first visit a so-called "implied consent" cookie bar will only appear once, and assuming that it has been read it will not show again within a year (on the same device, in the same browser). At ichingonline.net we show the cookie bar only to visitors from the EU, making use of the IP2Location LITE data available from http://lite.ip2location.com. In version 3.22 (May 19th 2015), the migration to HTML5 has been completed for the entire site. The pages for throwing the coins and reading the answer have been improved for use on a narrow (smartphone-) screen, but they still can better be viewed in landscape mode. Version 3.21 (March 22nd 2015), is a major technical upgrade. All pages with the main menu (the black bars on the left with one red for the current choise) have been migrated from XHTML to HTML5 and CSS3. More pages will follow this road to "Responsive Web Design" (RWD), to make the same page adapt to whatever type of device. With this upgrade still some scrolling and zooming will be needed for cell phones, but from tablets to smart TV's the lay-out works fine. Version 2.13 (March 22nd 2015), has been the last version of I Ching Online Original without the option to save your readings. It is the same technical upgrade as version 3.21. Version 2.13 was available till the end of April 2016, when it was replaced by version 4, iching.online, "in-the-cloud". In version 3.20 (February 10th 2015), I Ching Online's own Content Management System for Personal Notes has been expanded with a Public Note. Apart from Personal Notes, logged-in members can now find a Public Note on their My I Ching page, if appropriate. In addition, a Public Note can be placed on the Login page, should an urgent message be needed there, for example in case of some abnormality. Furthermore, a lot of other content of the site is now dependent on this CMS. Version 3.19 (October 27th 2014), is again a technical upgrade. Now stylesheets have been upgraded to improve support of RWD. In version 3.18 (July 20th 2014), again you have one more reason to become a subscribed member. From now as a paid-up member you have an extra option on your My I Ching page, where you can set a cookie on your current device (in your current browser) that will automatically keep you logged in for one month, one quarter or as long as one year. This cookie exists until you actively log out or until you unset the cookie on your My I Ching page. The autologin cookie can be renewed any time you want, also before it expires. Version 3.17 (July 1st 2014), is again a technical upgrade. Version 2.12 (July 1st 2014), is the same technical upgrade as version 3.17. In version 3.16 (March 2nd 2014), suppression of ads has been improved. From version 3.3 (March 3rd 2012), paid-up members already had an extra option on their My I Ching page, where they could choose to turn off (Google-) advertising on the site. Now even ads on the Richard Wilhelm- and Zodiac-pages are suppressed. With this option you can have the site entirely ad free if you wish. Version 3.15 (January 23rd 2014), is a next step in the project "Responsive Web Design" (RWD for short), to make the same page customized for any type of device, from mobile phones & tablets to smart TV's. As an unintended result the main menu bars now resemble hexagram lines. Version 3.14 (December 30th 2013), is a technical upgrade. Detection of the device that is used by the I Ching Online visitor has been improved. E.g. tablets can be distinguished from other mobile devices. Type of device, OS and browser are now combined with screen resolution for adapted lay-out. With version 2.11 (August 12th 2013), the I Ching Online Original has been moved physically to a different host. In version 3.12 (August 4th 2013), the lay-out of the site is synchronized with our classic version, I Ching Online Original, that does not have the save-reading option. If you never want to save your readings, and do not visit I Ching Online on your mobile device, you could as well use this basic version of I Ching Online, which has exactly equal functionality, but without save-reading option. This last version 2.13 has been available till the end of April 2016, when it was replaced by version 4, iching.online, "in-the-cloud". In version 3.11 (March 11th 2013), a kind of mailbox has been added to the My I Ching page, where you can read a Personal Note, if you have one. If you have an unread Note, you will be notified when you log in. You can keep the Notes in My I Ching, or check the ones you wish to delete and click Delete selected. There is every chance that this option will never show, when there is no reason for a personal message to you. From version 3.10 (November 12th 2012), you may have again one more reason to become an I Ching Online member. All paid-up members now have an extra option to download their readings. Once your payment has been registered (usually within a day), you will see an extra option Download readings in your View Readings page, where you can choose to download all of your saved readings to a CSV-file on your own laptop or desktop computer, for further analysis. From version 3.9 (October 14th 2012), on the (Changing Lines tab of the) Reading page, you can now click on any Changing Line, to read about it. Until then you could only read about the one changing line that applies to your question, according to a set of rules. You can still do so, but when you click a changing line, the "primary text" of that line appears, and by pressing the Read original text button, you can read the Richard Wilhelm translation for that line. Clicking this (second) tab again will reset the page. With this improvement, a wish of many I Ching Online visitors has come true. In version 3.8 (September 3rd 2012), a Tao Te Ching page has been added. The Tao Te Ching is a Chinese classic. Every day we issue a "verse of the day" for contemplation, in two leading English translations, that nevertheless differ substantially. Perhaps, when comparing the interpretations, the true meaning will emerge. In version 3.7 (July 30th 2012), the search function on the View Readings page has been improved. You can now search for Readings which had a particular Cast- or Transformed hexagram for an answer. You can combine this with the existing search for questions containing a specific text. With version 3.6 (May 20th 2012), the mobile version of I Ching Online is good enough for mobile devices with a full internet browser, like iPhones or Android phones. Because smartphones have a touchscreen with no mouse-over functionality*, the so-called 'tooltips' (the small 'hover boxes') did not work. Every tooltip (many hundreds of them in the Richard Wilhelm- and Zodiac-pages), if it had relevant information about the picture being hovered over, has been replaced by a subtitle. And even for desktops or laptops this turns out to be an improvement. *) Except for smartphones with Android 4.0+ and a stylus (touch pen), like the Samsung Galaxy Note, which do have mouse-over functionality. The mobile version of I Ching Online was especially designed for this Samsung Galaxy Note. Version 3.5 (May 3rd 2012), is a technical upgrade as a preparation for a mobile version of I Ching Online. Screen resolution is now used for adapted lay-out. In version 3.4 (March 27th 2012), the View Readings page has been improved. You can check all Readings that you want to delete, and click Delete selected to remove all checked Readings at one go, instead of having to delete them one by one, as before. From version 3.3 (March 3rd 2012), you may have one more reason to become an I Ching Online member. All paid-up members now have an extra option on their My I Ching page, where they can choose to turn off advertising* on the site; not only for mobile devices, but for all platforms. Nothing wrong with ads, but if you just dislike them, or when you log in with your smartphone and find them annoyingly interfering with buttons, you can choose to view the site without ads. Once your payment has been registered (usually within a day), you will see an extra option Display pages in your My I Ching where you can choose Without Ads. *) Except for the Richard Wilhelm- and Zodiac-pages. From version 3.2 (February 21st 2012), when you have entered your question and click the Continue button, a new window opens with a separate page for throwing the coins. Entering the question and casting the coins have been separated, in preparation to a mobile version of I Ching Online. In fact this change makes the site more adapted for smartphones already. Please have some more patience for a truely mobile version. Version 2.9 (October 23rd 2011), is without the option to save your readings. If you really have no intention of ever saving a reading, you'd better use this version. All texts are exactly the same, but it is 'static', and should load a bit faster. This I Ching Online Original was available till the end of April 2016, when it was replaced by version 4.0, iching.online, "in-the-cloud". In this version 4.0, once you get a miraculously appropriate reading, you WILL have the possibility to save it instantly. Just click Save reading and your reading will be saved in version 3, if you are a member. If not, click Register in the Login screen to become a member. Your question with corresponding reading will then be saved after all. In version 3.1 (September 19th 2011), an extra function has been added where you can edit your past questions and save the reading again. On the View Readings page, a question can be edited when the Edit question or delete reading: checkbox is checked. If checked, next to the now editable question appear two options. Version 3.0 (September 2nd 2011), is a complete metamorphosis! Now it is possible to keep a record of past readings, with a personal login for members. When you ask a question and read the answer, a Save reading button appears, to save your reading. When you are logged in already, your question is saved instantly, giving you a confirmation. If not logged in, the Login screen appears, and after giving your credentials the reading is still saved. To log in, you must be a member. In the login screen a Register button invites you to become a member, if you are not registered yet. After filling in the details and accepting the terms and conditions, you are a member, and your reading is finally saved. The first three months of your membership are free. During this free trial period you can make a membership payment for half a year ($12) or for one year ($18). Your paid membership begins three months after your registration. When you are a member, in every screen two more menu-items appear: My I Ching and View readings. In View readings you can leaf through the pages with your readings, and search for particular questions and answers! In My I Ching there is an option, especially for smartphone users, not to be plagued by ads! Mobile devices are recognized, and the most annoying ads (those that sometimes interfere with buttons or text) have disappeared from your smartphone screen already, but once you are a paid-up member, you have an extra option to turn off advertising on pages with buttons. Plus, you can change your personal details and settings in My I Ching, including time zones, and see the payments you have made so far. Your info is secure; no credit card numbers are stored. On this same page there is a PayPal button to make a membership payment. In future versions new functionality will be added for "members only". Version 3.0 Bèta (July 25th 2011), has been tested by a panel of 50 volunteers. In version 2.8 (February 20th 2011), an extra page has been added where you can have your Chinese Zodiac Sign calculated. When you click the image of the sign, a new page pops up with the most salient traits that are attributed to the sign, and which description can be remarkably accurate. You can read as well how the sign relates to other signs, to which you can click through. Version 2.7 (October 24th 2010), is a technical upgrade (as version 2.3), in preparation to added functionality in the near future. Again the engine to throw the coins, visualize casting them six times, and display the answer in different tabs, has been rewritten entirely. Casting the coins and showing the answer have been separated, as necessary preliminary work for new features to be added to I Ching Online. When you click the Read button, a new window with the answer opens; for the rest everything works the same as ever. The new feature has an unintended advantage: when you Throw coins by hand and click Read when done, the window with your cast filled in does not disappear. After reading the answer, you can still change the pattern and click Read again. Repeat this as often as you like. Version 2.6 was released on October 10th 2010 (indeed, accidentally 10-10-10), in which again an improvement was made to the Site search. The reason for the change was the announcement by Google that for the old Site search code, support would be discontinued in a short while. As always, when something is lost, something better takes its place. You can still enter a search term and click the Site search button on the left of the page, to search all the pages of I Ching Online, including the Richard Wilhelm texts. The only difference is that the radio-buttons to choose between searching I Ching Online and the entire internet, have disappeared. Instead, when you press the Site search button, a new page opens with the results, where you find a Custom search button below the results. Here you can search the rest of the internet if you did not find what you were looking for. The text area is already prepopulated with your Site search term, but can be changed. In version 2.5 (May 22nd 2010), to all Richard Wilhelm texts; hexagrams and changing lines, have been added relevant illustrations. Of course, anytime we find a better picture for some subject, we'll replace the old one, but for now the entire text is illustrated. Version 2.4 (December 13th 2009), has some extra features when you read an original Richard Wilhelm text. Instead of one new window that opens for the Richard Wilhelm page, three different cascading windows will open, resp. for the Cast Hexagram-, Changing Lines- and Transformed Hexagram pages. This has been done for (Windows) Safari and Chrome users, as in these browsers, if the same window is opened the second time, it will not be on top of the last window, but remain hidden in the background. Furthermore, the question you entered (if you did) before throwing the coins, is repeated on the Richard Wilhelm page, so that you can tell to what question is the answer. In addition, the Cast- and Transformed Hexagram page will show you whether it is the Cast- or Transformed Hexagram as an answer to your question, because now you can have both pages open. Version 2.3 (December 6th 2009), was a technical upgrade, in preparation to added functionality in the near future. Apparently, the site hardly changed, at least visibly, but in fact the engine to throw the coins, visualize casting them six times, and display the answer in different tabs, has been rewritten completely. This was done as necessary preliminary work for intended new features that will be added to I Ching Online. In version 2.2 (January 8th 2009), a major improvement was made to the Site search. Since then, a proper Site search is made possible, by allowing Google to index the Richard Wilhelm text-pages. If you want to read a Richard Wilhelm text again for a particular hexagram or changing line, use the Site search button on the left of the page. For example: type in hexagram 38 line 3, leave the radio-button checked for IChingOnline(*), and click the Site search button. A good chance that you find the page with the Richard Wilhelm text for hexagram 38 and the third line changing. Or use any headword you remember, if you have forgotten the hexagram number. A slight improvement to the great leap of version 2.0 was made with version 2.1 (July 23rd 2008). At the bottom of the Trigram tab now is a Custom search button. Pressing this generates a Google custom search for the literal question you typed in. For this button to appear, you must have typed at least some valid characters. The Custom search result page is not the same as when you had put the question to a normal Google search page, because the result is customised for people like you; interested in Eastern studies and I Ching. Use it for getting inspiration, the results can be amazing! Since July 19th 2008 we have I Ching Online Version 2.0, with the original Richard Wilhelm translation integrated in the tabs for the Cast Hexagram, the Changing Lines and the Transformed Hexagram. If applicable, at the bottom of the tab appears a Read original text button. By pressing this button you can also read an excerpt from the original Richard Wilhelm translation for the particular hexagram or changing line. Since January 12th 2008 we have I Ching Online Version 1.1, with a new feature for throwing the coins, which is described in detail on the instruction-page. Before then you could only cast the coins virtually. Nothing wrong with virtual coins, but if you insist on using your own real metal ones, you can do so now, by pushing the Throw coins by hand button, and fill in the result of your cast by flipping the coins on the screen. The coins turn around when you click them. When done, the Read button works as ever. The new feature comes in very handy as well, when you want to read back a former reading. When you remember the pattern of lines, you can fill them in later, and see the answer again. Of course, the old Throw coins virtually button still works the same. October 1st 2007, I Ching Online Version 1.0 was launched, hosted with Hostgator in Texas and with very basic functionality. In the early morning of July 1st 2007, the idea for I Ching Online was born in a dream, and this same day the domainname ichingonline.net was registered with the Dutch registrar Dootall. It took several months developing before the first working prototype could be demonstrated.